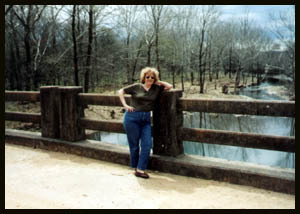 Me on Greenleaf Bridge 4-1-2001 This is me out on one of my exploring expeditions. This old bridge was built over Big Greenleaf creek back in the 30's. It was completed in 1938. The reason it is called Big Greenleaf is because there is a Little Greenleaf creek too. There used to be an old Greenleaf school located just North of where I am standing. There was a store and a post office back then too. Back in the early days, there was a swinging foot bridge to cross the creek. The WPA built the bridge you see here. See more of Greenleaf here. 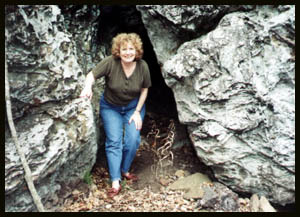 This is me in the opening of a cave north of Black Hollow road, at a mountain that daddy called, "Devils Backbone". It is in the Wildlife Game refuge in Cherokee county, OK. I love going there and exploring old wells, cellars and rock remains of foundations of old homes that used to be there before they had to be moved out in 42 for the development of Camp Gruber. It is now a Wildlife Game refuge and hunting area. 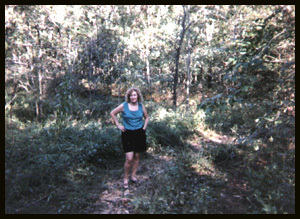 Me on one of my explorings. 9-30-1997 I decided I was going to look for the old McCracken cemetery where a lot of my relatives were buried and were relocated when Camp Gruber was developed in 1942. Sept is not a good time to be exploring around in there (due to snakes and ticks still being out), but we had to go when we could. People are allowed in there during hunting season and not all year round. So I was determined to at least try to find the location of it this day. I didn't find it then, but I did in Dec of this same year. See it next; Next more of my Exploring.